These two parts and three meanings altogether give insight into how the ancient Chinese understood medicine. The character 藥 originated from its lower part, 樂, which speaks to the historical use of music to heal illness since Chinese antiquity, even before the discovery of herbal medicine. According to Chinese mythology, Huang Di, or the legendary Yellow Emperor, who is revered as the forefather of the Chinese people, was once challenged to a battle by Chi You, the atrocious leader of an ancient tribe. Blessed by the divine fairy Xuan Nü to promote the virtuous and condemn the tyrannical, the Yellow Emperor was advised in a dream that only the deafening sound of a drum made of the skin of Kui, a wild ox monster that resided in the coastal East Sea, could defeat the metal-headed Chi You and his tribe. Upon awakening, the emperor immediately ordered the capture of Kui. Kui’s skin was then used to produce 80 drums. When the emperor’s soldiers sounded the drums on the battlefield, the earth shook in all directions and Chi You’s soldiers were knocked down, their metal heads cracking and in great pain. The music master untied the strings from the bows of the emperor’s army and attached them onto a hollow piece of wood. He then took a small, thin piece of metal and gracefully plucked the strings, producing lovely music. Gradually, the injured soldiers regained consciousness. Inspired by this instrument, Cang Jie, the official in charge of creating characters, constructed the character 樂 for music. Thus it can be seen that the structure of the character?is a skillful and perfect representation of the lifesaving instrument. Based on this early first use of music to heal the injured, the character for music was later integrated into the character for drug or medicine, 藥. 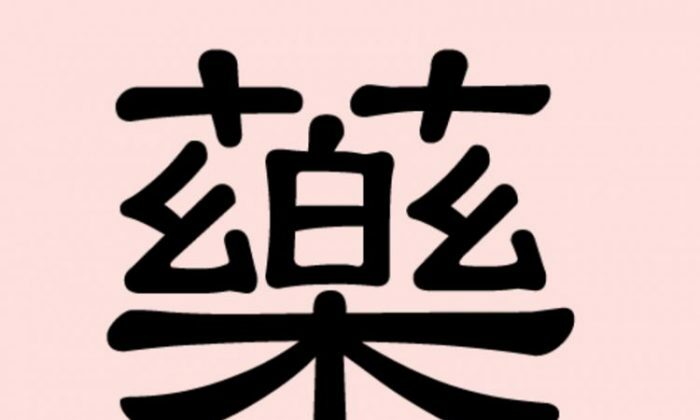 The Chinese character for music has a second meaning: delight and happiness. While the obvious relationship is that beautiful music can bring joy, joy has another relationship to medicine. Medicine is characterized by bitterness, yet a patient is able to regain health and happiness only after suffering its bitterness. This paradox has its root in the “Doctrine of the Mean,” the Confucian classic which teaches that to gain an invincible position one must determine and hold fast to the “mean,” the middle ground between two extremes. Such a view enables one to find hope amid adversity and to exercise prudence amid prosperity. From this principle, it can be seen why happiness, 樂, is contained in the bitter medicine, 藥. The 艹 radical at the top of 藥 refers to grass and related plants, including herbs. According to mythology, Shen Nong, regarded as the father of agriculture in China, sampled hundreds of herbs to test their medicinal values. He is also credited with establishing a comprehensive basis for traditional Chinese medicine, later compiled into China’s first book on pharmacology, called Shen Nong’s Classic of Herbal Medicine. Thus it is appropriate to find the?radical contained in the Chinese character for medicine. The Chinese character Dao expresses the concept of achieving spiritual enlightenment through walking the right path. The Chinese character for dream, 夢 (mèng), conveys the idea of not being in the brightness of daylight and thus not seeing clearly.